Simple question. Solely from an ignition perspective, a backfire out the inlet manifold is that ignition too advanced or retarded? I was trying to fire up a 4.6 Thor on starter fluid with Edis in default mode and while the engine is trying to start it is backfiring big time through the inlet manifold. It does not have petrol on it as yet but does have an old style LPG system but before I try to get the engine to run on the LPG I want to make sure it is not going to backfire on me. I feel that the engine is advanced more than the default 10 degrees and will need to adjust the timing but just seeking advice whether a backfire through the inlet manifold has timing too advanced or retarded. I'd guess at quite a bit too much advance - did the engine seem to kick back too? Did you set the trigger wheel and sensor with the engine in the car? I got that rather wrong too first time round. Think I then drew things out so I could check it was at least where it was supposed to be, using the MegaSquirt instructions. And even then, a timing light showed it was a few degrees out. You probably know this, but EDIS doesn't like a modern posh timing light were you can advance where the flash occurs. I had to get my basic strobe back from my brother. So old it has a direct connection to the plug terminal. Dave - Thanks for the response. No kickback just a big backfire on the first start and later smaller ones on subsequent starts. Engine was wanting to fire but also farting back out the intake. This vid was taken last year with the carbs on the engine so running petrol but starting on starting fluid with EDIS in default. The trigger wheel etc has not been touched since this start. The difference this time is the Thor manifold on the engine - ignition is unchanged and petrol not connected. As you can see in the vid starts and ran fine back then. I need to drive the vehicle a few km to get a gas inspection done and I was hoping it would move under its own power for this on LPG (not injected). If it is backfiring like it is now I am definitely not going to let any LPG near it. If I can get the engine to start and run a second or two on the starting fluid with no backfire I will switch the LPG on and see if the engine will continue running. Re the timing light - yes I am aware of that issue and have both timing lights. I did put a light on it last year when running on edis in default mode and I got 13BTDC not 10BTDC so I came to the conclusion that my home made timing pointer was out (I had to find TDC via the indicator down the No 1 spark plug etc. I wasn't too worried as I figured I could sort it all out when I MS3 on but that hasn't happened and I have to get this gas inspection done before the end of the month. I will adjust the trigger wheel sensor tomorrow to take some of the advance out of it and see how we will go. firing order most likely wrong. Thanks Steve- yes considered that. 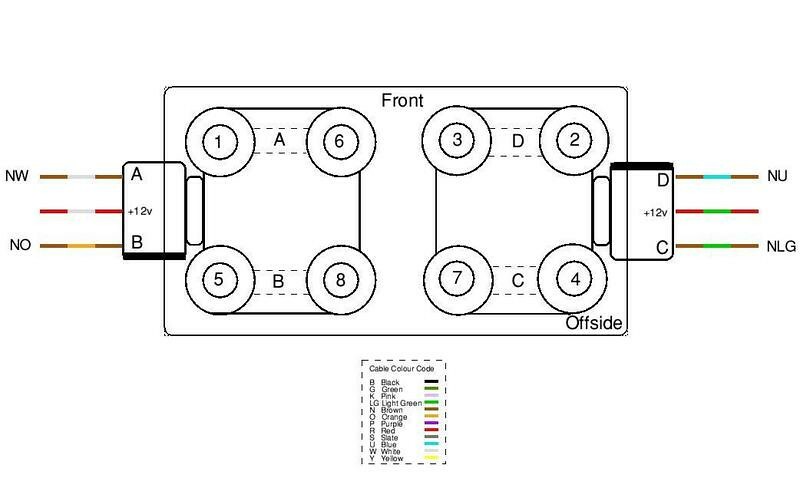 I actually got the firing order diagram from Dave and is what is in use in the above video so Dave's diagram that he sent me is correct. However only two hours ago I rechecked that I had put it in the correct way and it is. I thought the trigger wheel, EDIS thing was supposed to be straight forward but is not working for me . Hence my other thread about a dizzy timing cover. Ok - gotta come clean as I found out something yesterday. I had wired the coils the wrong way around - previously when the engine ran all the wiring was just jury rigged and somehow doing the permanent wiring I got it all wrong. Now it was not that I had plugged in the plugs into the wrong coil, but I had actually sent the wires for the left coil to the right coil and vice versa - the harness to the right coil is a lot longer than the one to the left so I had not just plugged in the wrong plug to the wrong coil - I completely stuffed it up - so late yesterday, I cut the cables and reconnected them the correct way. Well the engine fired on first start (it will not run on the carbs) but with a dribble of starter fluid going into it I managed to get it to do a reasonable idle for two minutes - so now I know I have reasonable ignition and just need to sort the carbs that have been sitting for 2 years so just might need a clean out - I will see if i can get it to run on the LPG this week before playing with the carbs. So it has taken a little while but with all your help I have been able solve this little mystery - and cause myself a little embarrassment . Ultimately this engine will be injected and running on MS3 with no EDIS but what this issue has reminded me is that it is best to deal with one issue at a time. So the plan is now to leave EDIS as it is and get the engine running on the carbs (where I was 2 years ago). Buy a Megajolt ECU so that when still on carbs I have full ignition control. When I have that I will pull the carbs off and put on a 14CUX injection manifold and get it running on its ECU with Megajolt ignition. Then bring in the MS3 to start on ignition or fuel then both and do away with EDIS - then sell off EDIS, Megajolt, 14CUX ECU etc. I dont want to be sorting fuel or ignition at the same time - it is too stressful. It's why I tend to buy the correct colour wire when modifying an existing loom. Or alter the schematic to show the wire colours actually used. Easier to alter a drawing than a loom. And after building a new loom, use a continuity tester to make sure everything goes to where it should do. You make a very valid point though. No auto wiring supplier? But a loom from a scrap car can be a decent source. I tend to use one from a hotwire Range Rover to supply the wire for an MS one. But the main thing is to have enough colours (of the right wire gauge) to differentiate in any loom. And note down what they are and do. When I bought wire I could not get wire that matched so I got the closest I could. The reality of living in Aust you have to buy most of your non mainstream parts from overseas.